Analytical devices based on microfluidics represent a breakthrough in life science research as well as in diagnostic and pharmaceutical applications. Microfluidic analyses require less sample material, allow for a reduction in the amount of expensive analytical substances and are usually performed within a shorter time interval. Still a great challenge in the manufacturing of microfluidic devices is the bonding of substrates made from different materials, especially if delicate biological substances are applied to the microfluidic substrates prior to the bonding process. The aim of the project was to develop an automated solution for bonding multi-layered microfluidic devices made from different materials that is suitable for mass production. As one microfluidic part is coated with biological molecules before bonding the complete bonding process needs to be carried out at room temperature. 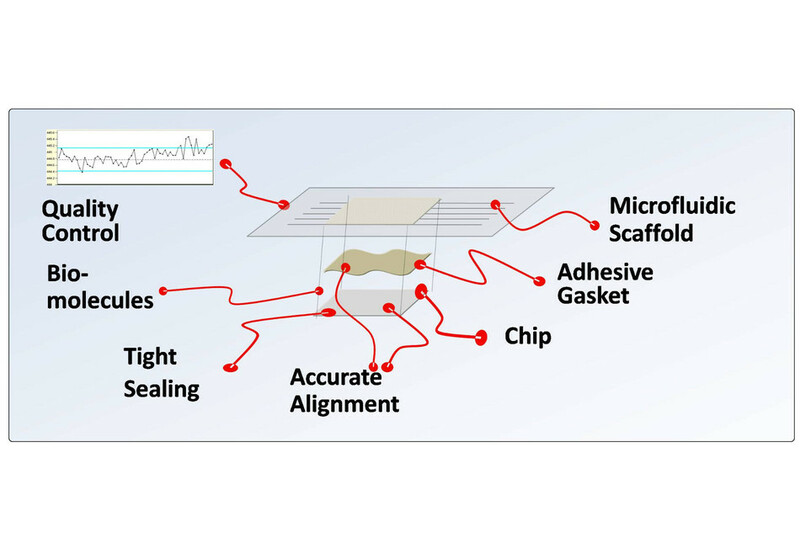 The multi-layer microfluidic cartridges consist of a plastic scaffold, an adhesive gasket and a pre-coated glass chip. A robotic cell has been designed for the assembly of individual microfluidic parts. 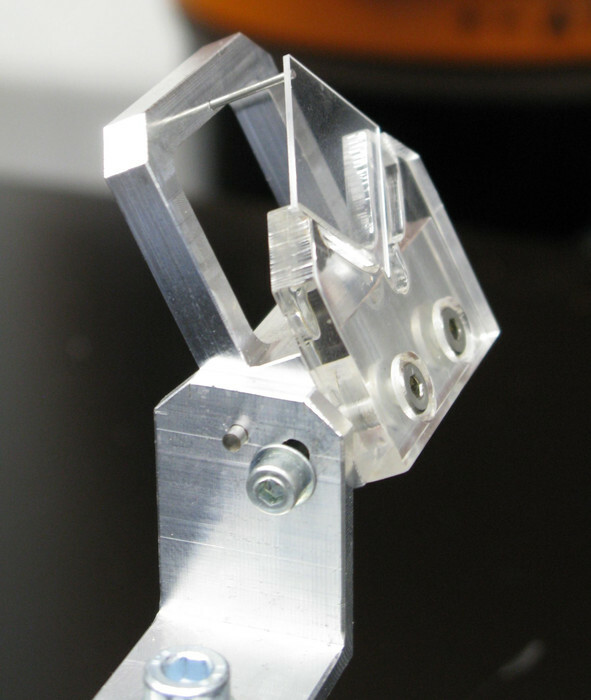 The microfluidic parts are positioned with pick and place operations using a custom-built vacuum gripper. 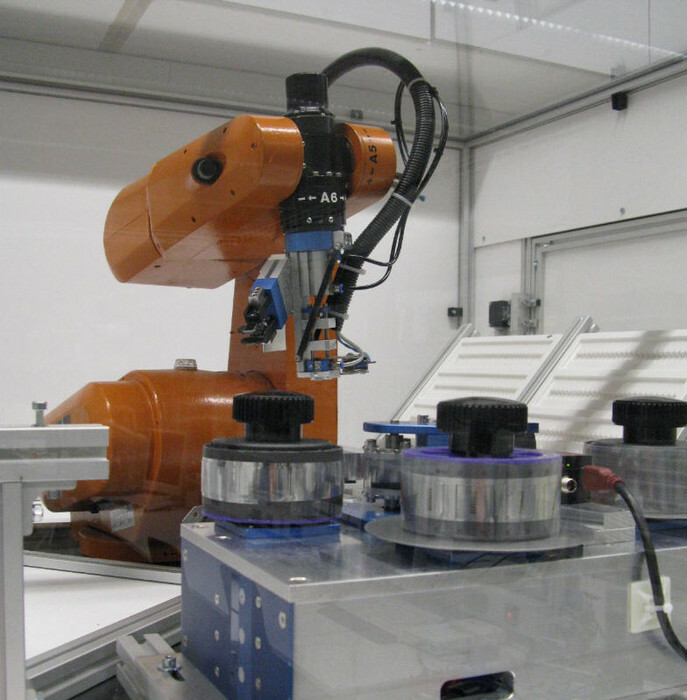 The gripper touches the glass chips just on the outside edge thereby preserving the coating with biological molecules. The glass chips are not supplied in a well-defined order but can be presented to the gripper in eight different positions. Hence, to ensure correct positioning a visual control has been integrated to determine the orientation of the glass chips. 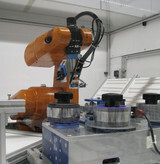 Upon recognition of the chip orientation the gripper adjusts itself to pick the chip correctly. 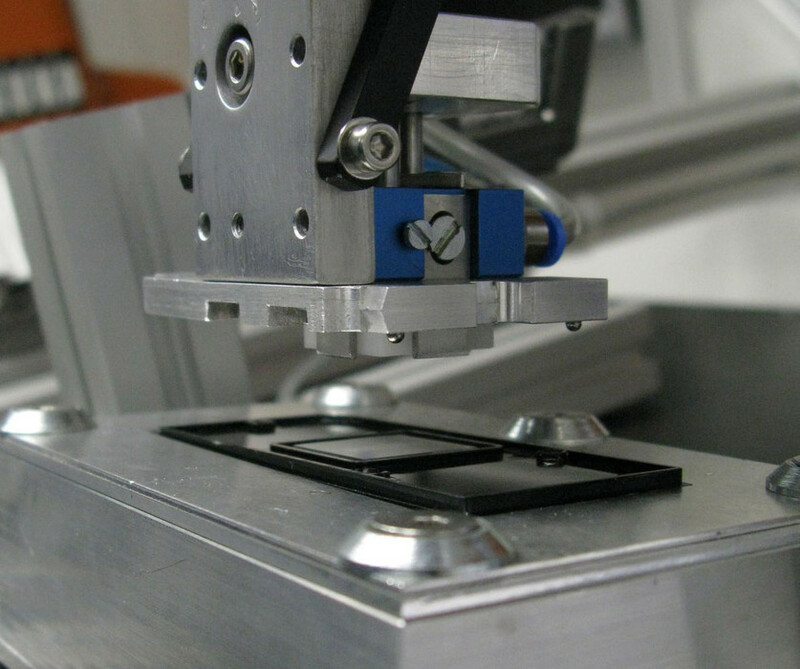 Hybrid bonding is realized using double-sided lasercut adhesive tape gaskets wich are fed automatically to the assembly station. For the tape gasket a material had to be identified that does not interfere with the biochemical reactions of the microfluidic assay by non-specific binding. Precise aligment of the individual parts is assured by a vision based look-and-move control. Experiments showed that this bonding procedure for hybrid microfluidic components yields tightly sealed microfluidic devices. Means for quality control are integrated into the system.